Logic is used to complete the Microscope Prints and Space Prints Collections and is part of the Nerd Brain and Renaissance Sim Aspirations. 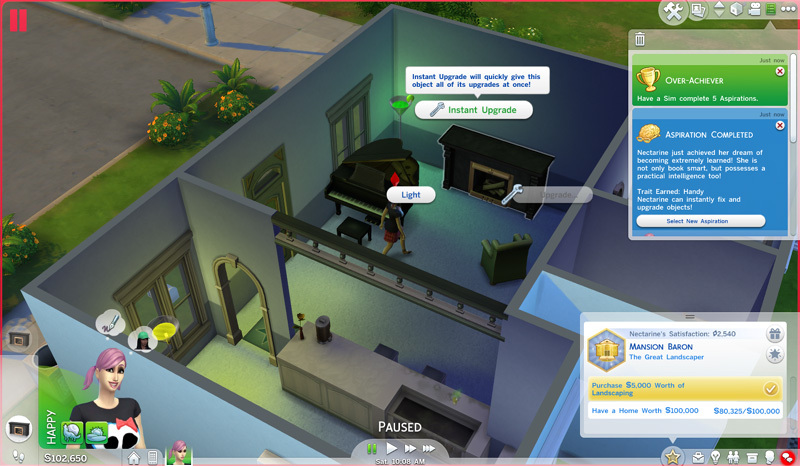 Logic is also used in the Astronaut Career and the Criminal Career (Boss Branch only). Completing the Nerd Brain Aspiration makes you Handy, which allows you to Instant Upgrade any object. Instant Upgrade gives an object all its upgrades and doesn’t require components. There’s a long cooldown though. For info on Books, Skill Books and Reading (for Nerd Brain), see the Writing page. ♥ Genius – Randomly Focused. ♥ Geek – Because it kinda suits (also helps with collectibles). ♥ Speed Reader (1,000) – Helps with Nerd Brain. Both Space and Microscope Prints function as Focus Decor. The rare prints allow you to “View Focused Work”. 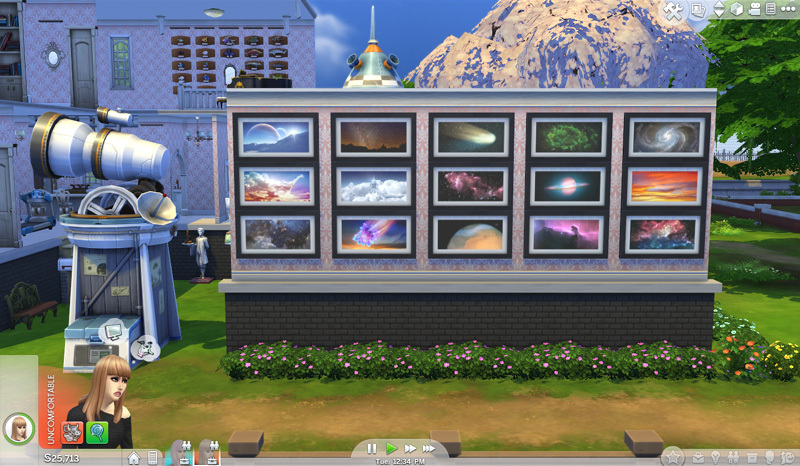 You get Space Prints from using the Observatory (raises Logic, Fun). The Augment Telescopic Eyepiece upgrade (Handiness 9) increases your rate of finding Space Prints. ♥ It must be night. ♥ You must have Logic 7. ♥ You must be Focused. The Improve Lens Quality upgrade (Handiness 9) increases your rate of finding Microscope Prints. The rarity of the subject doesn’t matter. A sample from a Cowplant is no different from a slide from any wild plant, so you don’t need Gardening for this. 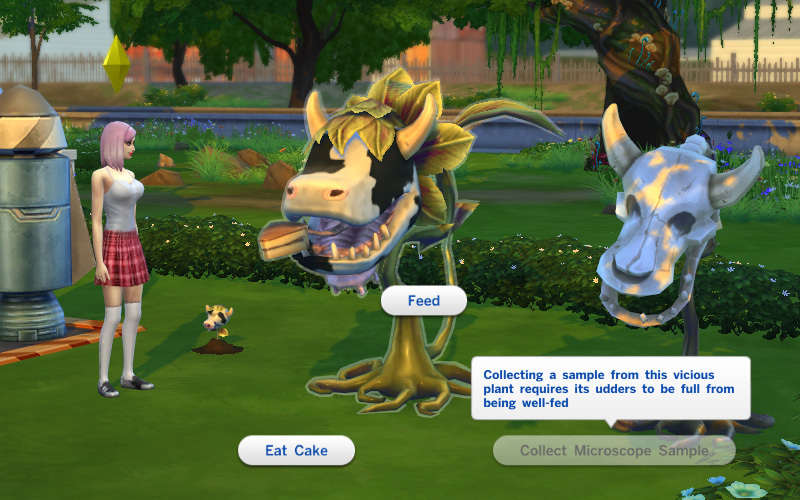 A Cowplant needs to have eaten from a sim before you can take a sample. Be sure to take the sample before you milk it.